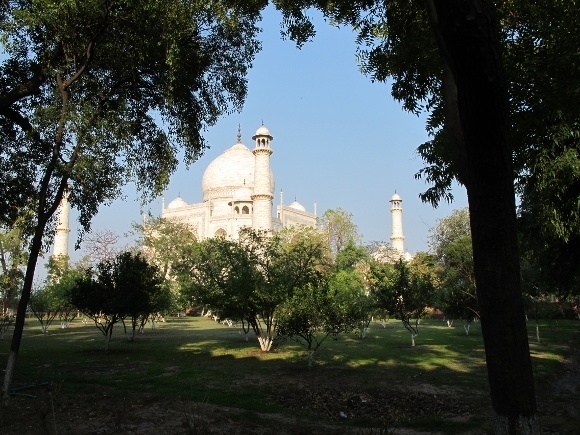 Enchanting Travels guest Sue Toft-Hunt enjoyed a Taste of North India and shared with us some of beautiful scenes that she captured across Delhi, Agra and Rajasthan in photos. 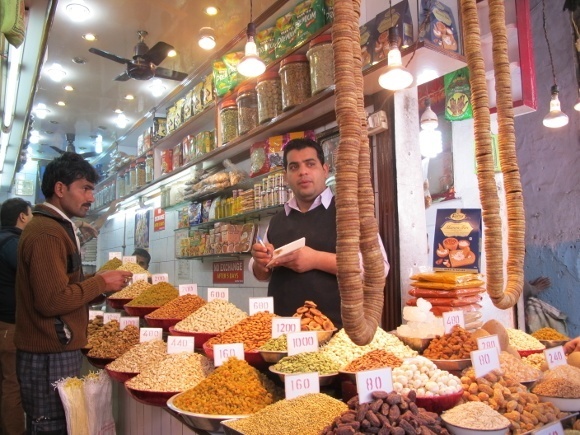 They say that variety is the spice of life and there is nothing like the spice markets of Old Delhi to give you just that. With mounds of spices from cinnamon to turmeric to cardamon to cloves, black pepper; dried fruits such as mango, raisins, apricots; and nuts from cashews to almonds to walnuts, it is a feast for the senses. 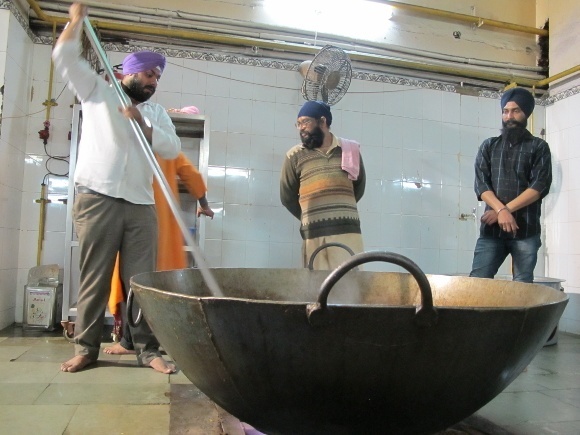 Next stop, a place we’ve previously written: the Sikh Temple that feeds 5,000 people in Delhi – every single day. Sue and her husband ventured to the Gurdwar Bangla Sahib kitchen to witness the epic operation with huge pots of simmering curries and thousands of chapattis being rolled out that are loving prepared by volunteers. Naturally, a first trip to India is rarely conducted without a visit to the world’s most iconic emblem of love. Yes! The Taj Mahal in Agra is an experience. This photo was taken from the surrounding gardens – an alternative perspective from the usual front-on photos. It’s great to explore the old steam engines at the National Railway Museum. 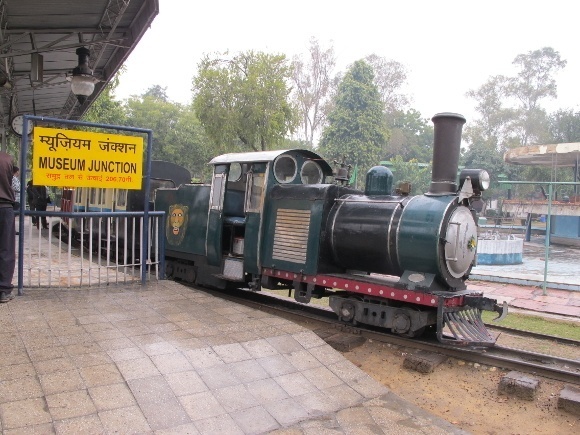 It’s a must visit for railway enthusiasts as you will see many of the British-engineered trains that has made the Indian Railways one of the three largest government employers in the world. In Rajasthan, there’s always a hubbub of activity using the natural resources for daily requirements. You will stumble across scenes like below everywhere you go in the state. 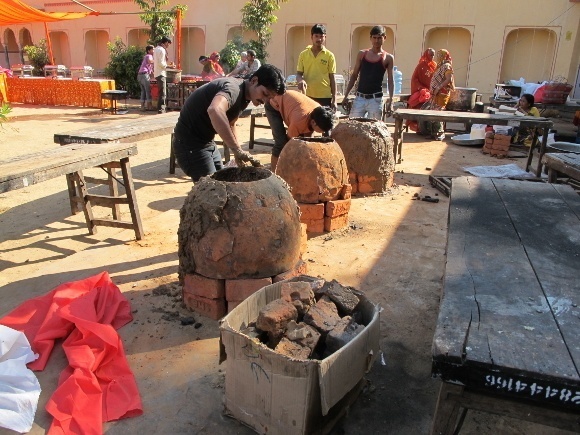 This particular building is at the gardens of Sisodia Rani ka Bagh, in the hills near Jaipur, where they were building Tikka ovens in preparation for a wedding. Spring is the height of the wedding season. 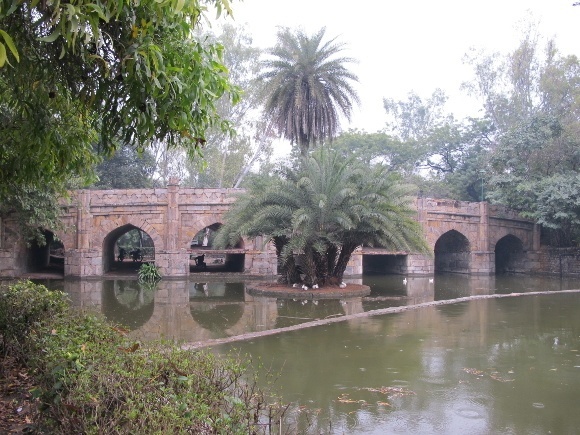 This bridge over tranquil waters is in the Lodi Gardens, Delhi. As Sue was interested in gardens, her trip coordinator Nikita made a point of including several in the itinerary, even managing to get them very limited tickets to the presidential palace gardens. The Lodi tombs and this bridge are centuries old but surrounded by an English style park created in the 1930s. 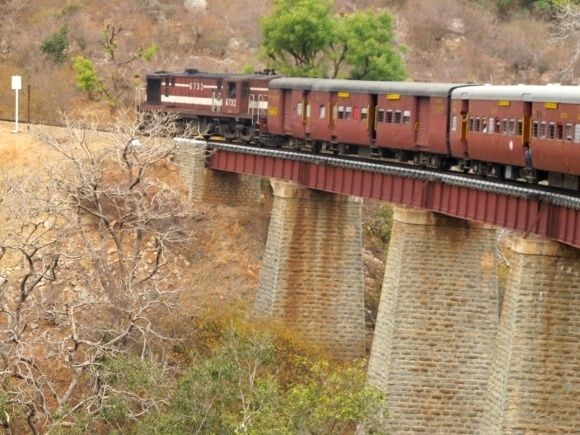 You can experience the bountiful and often lush nature of Rajasthan when you go on a special Rural Rail Ride from Deogarh. It’s a unique experience that pays great homage to the past as well as providing transportation for locals. As you travel in the countryside through viaducts into forested areas this is an authentic experience that our guests always enjoy! 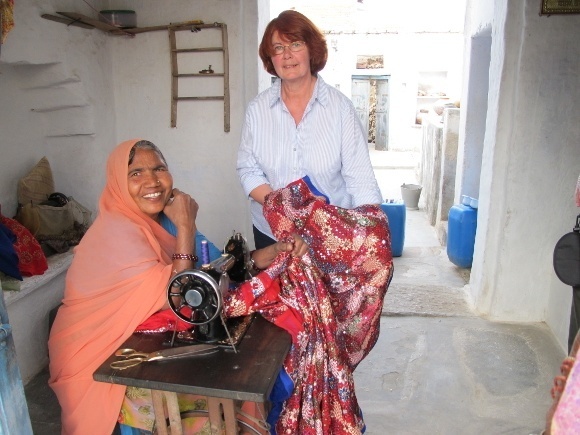 In the rural village of Deogarh, Sue chanced upon a local seamstress who she says was so welcoming and proud to show them her work, all done on an old treadle machine. 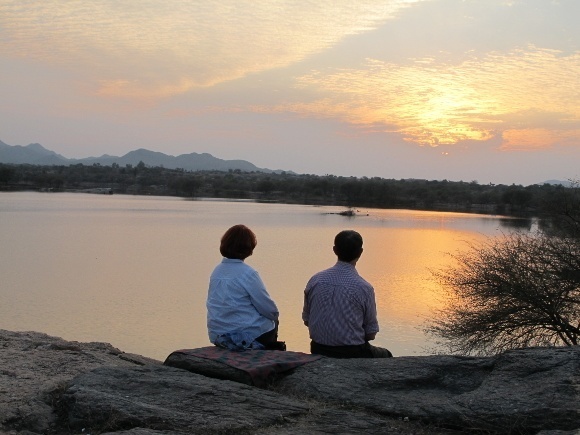 Again, in rural Rajasthan, you will be amazed by the splendor of sunsets, which you can enjoy in true tranquility within the local environs. It’s an experience fit for a Maharajah and Maharani! You will find many women with their hands painted in henna displaying fabulous patterns and motifs. 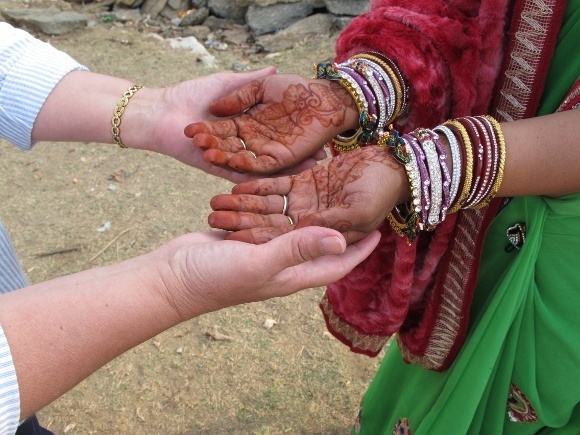 The henna tradition is common amongst newly married brides. Sometimes you might just want to monkey around! These little gentle monkeys befriended Sue in the residence at the Galta Remple, near Jaipur, and were happy for her company. 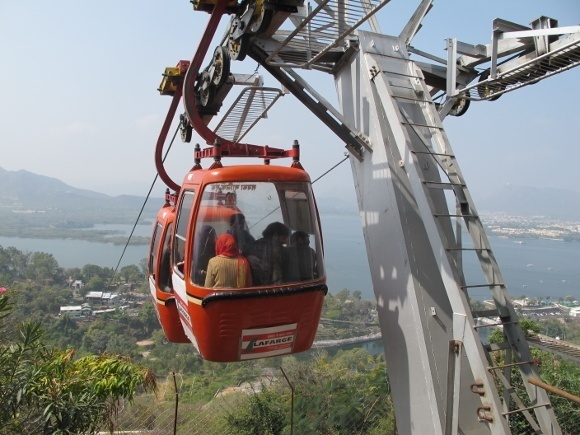 What other way to take in the stunning views of Udaipur, Rajasthan’s City of Lakes, than a cable car ride? The famous Lake Pichola can be seen in the shimmering distance of this photograph! You can enjoy your own Taste of Rajasthan with our sample trip that can be personalized to your own wishes. All our tours are completely private, with 24/7 support and quality tested accommodation and services. @Sue, I must truly appreciate the pictures you have shared on this blog, they are all impeccable. The Henna looks truly fabulous on your hand. I guess you had a great time with monkeys and got to see the true colors of Rajasthan.